Richard and Wendy Pini have donated the archive of Elfquest, the popular comic book they created 1978, to Columbia University Libraries/Information Services’ Rare Book and Manuscript Library. Columbia is getting every piece of original art from ElfQuest, including original art boards and pages from the comic book series, which was largely self-published by the Pinis. At first, the decision to hang on to every page of Wendy’s Elfquest art was mostly a commercial one; we never knew when we might need the original boards for reprinting. There was also an emotional component. I remembered the long hours Wendy put in, the editorial debates we had, the shared joy of seeing exactly the right expression on a character’s face. Now that we have high-quality digital scans of it all, we’re honored to donate the entire archive to Columbia. 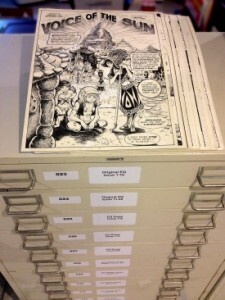 The Pinis’ archives also include original art from an unrealized animated adaptation of Michael Moorcock’s fantasy novel Stormbringer and from a graphic novel adaptation of The Masque of the Red Death; drafts of scripts and novelizations; copies of each edition of the ElfQuest graphic novels; fanzines created by both the Pinis and their fans; correspondence, contracts, and legal records; and the design for Wendy Pini’s Red Sonja cosplay costume. This entry was posted in Graphic Examples, Sercon and tagged Elfquest, Richard Pini, Wendy Pini by Mike Glyer. Bookmark the permalink.